Child Care Resource and Referral, a program of Southwestern Minnesota Opportunity Council, is celebrating 25 years of service with a name change. 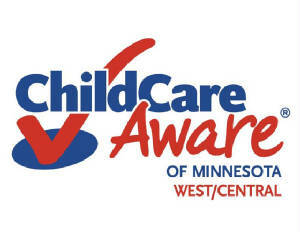 We are please to reintroduce ourselves as Child Care Aware of Minnesota. Child Care Aware of Minnesota network helps families find child care and understand their care options, supports child care providers through grants and education and informs the community on the importance of child care. The annual scholarship amount for families who choose programs with a 4-star rating is now $7,500!!! Congratulations to Joy Buysse on earning her 4-star rating - she is the first child care program in Region 8 to earn this rating! As of July 1, we can begin awarding children who will be 3 years old on September 1. 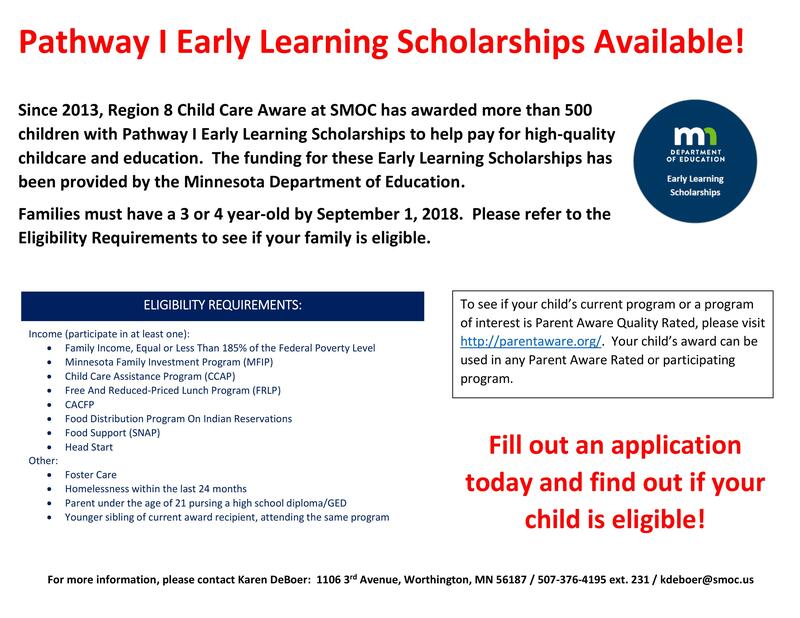 Early Learning Scholarships are now available in every county!!! There are no more restrictions, based on where the family lives. The Federal Income guidelines have increased. The new amounts are on the attached scholarship supplemental information form - click on the Early Leaning Scholarship located below. The new application is available! All families need to fill out the new form. Cottonwood, Jackson, Lincoln, Lyon, Murray, Nobles, Pipestone, Redwood, and Rock. We provide consultation, coaching, and technical assistance calls to child care providers child care programs. We provide technical assistance calls regarding child care to businesses and community organizations. We refer individuals with child care issues and/or needs to community organizations. Looking for Child Care? Questions on Child Care? Child Care Aware West/Central District Website.